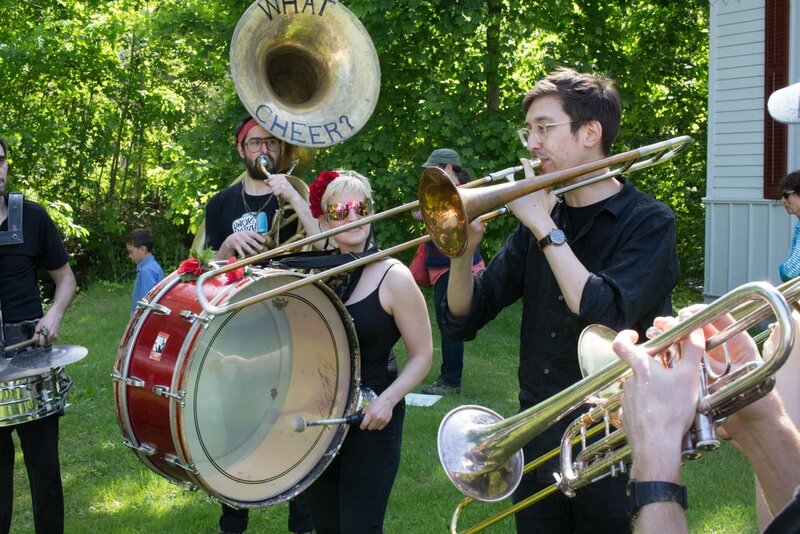 Celebrate the Wassaic community with us on Saturday, May 12th! What Cheer? Brigade, an exuberant 19-piece band, will lead a parade featuring community and artist-made floats. Other festivities include field day games, CAKE WHACK ($5), bouncy castles, the opening of our Summer Exhibition, and more! The party will extend into the evening with live music at The Lantern ($10 cover). * The Lantern will also be serving their famous fried chicken basket which includes coleslaw, fries, and a leg and thigh ($13). It’s a yearly reminder of why we do what we do, and why we do it here. So we pay it forward: The Lantern cover charge supports the Whale Scholarship Fund, which—in partnership with the Wassaic Fire Company and Silo Ridge Field Club—funds graduates of Webutuck or Dover high schools pursuing higher education and vocational opportunities. 5 PM to 9 PM: Block party and live Music at The Lantern kicks off!